You will absolutely love this beautiful 12 Days of Christmas paper by Graphic 45 and all the embellishments, stamps, and goodies that go along with it. I was just able to purchase some, but not all of these amazing items. I purchased what I could find and then ordered the rest. I fell in love with these so I wanted to make all the collection items available for you to purchase in our Christmas store. Our store is near the bottom of the page and below that you will find a video where a wonderful book has been made using this beautiful collection of paper and embellishments. I hope you enjoy it and get as many great ideas from it as I have. The 12 Days of Christmas paper pack features 2 each of double sided paper and comes in 12 x 12 inches, as well as 8 x 8 inches and is a very sturdy cover weight with all the 12 days features and words from the traditional holiday song. There are also lots of chipboard die-cuts and sticker sets, cardstock embellishments all in the coordinating colors and images, inlcuding 2 sheets of tags or journaling cards. Also available in the 12 Days theme are coordinated flowers, tags, pockets and banners. An added plus is a 6x6 paper pad with 36 sheets of coordinating patterns and solids. Note: This 6x6 is coordinating, but not all with the 12 days theme. To check out all the individual papers 12 Days paper pack, go to page 2 and 3 of the store and you will be see each being sold individually with good views of the back and front designs. 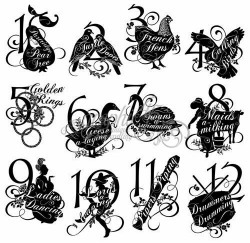 These stunning cling stamps depicting each of 12 Days of Christmas items from the Partridge in the Pear Tree to the 12 Dancers Dancing can be used separately or in conjunction with the paper and other wonderful embellishments. I love the fact that each of these stamps is a collage in itself, has the number of the day, the image from the section of the song, and the script incorporated into the stamp so they are all together. 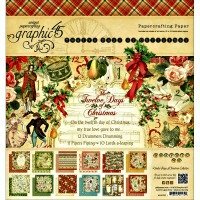 Check out our Christmas store for all the beautiful items in this 12 Days collection from Graphic 45. Check out this awesome video of a Book using the items from the Graphic 45 12 Days collection for a quick view of the beautiful papers and just one of the many ways they can be used for your Holiday photos. our Themed Scrapbooks for more ideas.